Alexander Petrovich Karpinsky was born in 1847, in Russia's Ural Mountains. The son and grandson of copper mining engineers, he spent his childhood in an area boasting a copper mine from the Bronze Age. The Urals provided Russians with a bounty of riches besides copper: gold, platinum, diamonds, sapphires, emeralds, amethysts, aquamarine, topaz, even chameleonlike alexandrite. The Urals held other treasures, too, namely fossils. 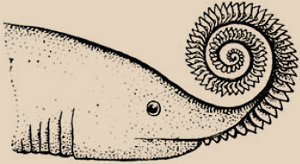 Various attempts at reconstructing Helicoprion over 115 years. Karpinsky suggestion configurations shown in (a), (b) and (c); (l) marks the reconstruction published in 2013. From "Jaws for a Spiral-Tooth Whorl" by Tapanila, Pruitt, Pradel, Wilga, Ramsay, Schlader and Didier in Biology Letters . Illustration by Ray Troll. Karpinsky may have picked up tips from the copper-mining field from his father, but didn't have many years to do that; his father died when Alexander was 11 years old. Alexander subsequently attended the Saint Petersburg school for mining, graduating when he was 20. His mining education complete, he returned to the region of his birth and worked as a mining engineer for a few years, but he returned to Saint Petersburg and taught at the Mining Institute for almost 30 years. Initially his interest was in rocks, their formation and distribution. He But fossils beckoned. Over the years, he acquired a reputation for specializing in puzzling, problematic fossils, so it's not surprising that his name is now linked with one of the strangest fossils ever found. Around 1898, a school inspector working in the region of Perm, which lies in the northeastern part of the European part of Russia on the western slope of the Urals, came across a weird whorl. At first glance, it might have looked like an ammonite, but sporting jagged spikes like a punk rocker's hair. The school administrator coaxed a journalist to photograph the fossil, and sent photos and a letter to Karpinsky. Years before news of the fossil reached Karpinsky, the British gentleman geologist Roderick Impey Murchison named a geological period, the Permian Period, based on the Russian city of Perm. Lasting from roughly 290 million to 250 million years ago, the Permian was the last stretch of the Paleozoic Era, that is, before the time of the dinosaurs. The strange whorl Karpinsky contemplated belonged to a shark species that lived during the Permian. In 1899, Karpinsky designated a new shark genus, Helicoprion. In fact, the fossil found in Russia wasn't the first Helicoprion fossil ever found; a partial Helicoprion whorl had turned up in Western Australia in the 1880s, but its fragmentary nature made it even harder to interpret than the complete whorl relayed to Karpinsky. The whorl wasn't an ammonite shell; it was teeth. Karpinsky made that call accurately, at least at first, but he misplaced the whorl of teeth. 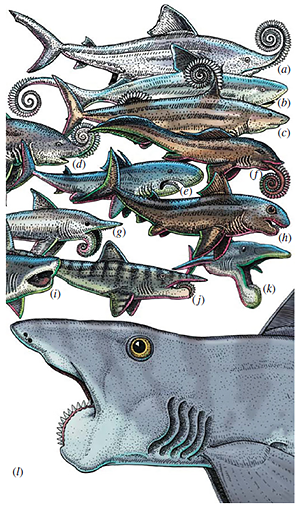 His first interpretation, published in 1899, included an illustration by Karpinsky himself, showed the teeth spiraling off Helicoprion's snout. Paleontologist Charles Rochester Eastman scoffed that Karpinsky's illustration couldn't be taken seriously, and was best ignored. In 1902, Karpinsky instead suggested that the teeth spiraled off the tail. In 1911, he tried again, suggesting the spiral was really comprised of defensive spines on the back. Born in czarist Russia, Karpinsky died in Soviet Russia, in 1936 — years after Stalin came to power. By then, he had long abandoned his interpretive efforts with Helicoprion. But Karpinsky might take some solace in knowing that the fossil would continue to puzzle for years, and he might delight in the latest interpretations. According to recent work, Helicoprion's spiral really does consist of teeth, a kind of circular saw in the mouth. But because of how the teeth grow, only a portion of the whorl, with only a dozen or so teeth exposed at any time. The spirals grow from the inside out, with the tightest turns and tiniest teeth on the inside.